When you create an account on EdReady, you will be able to choose the goals you want to pursue or enter a key to choose restricted goals. Each goal will direct you to one or more study paths, or might direct you to a site outside of EdReady. The goals you choose will form the basis for your dashboard and will define your activities in EdReady. If you pursue a goal that requires academic readiness, EdReady will administer an initial diagnostic of your knowledge for the study path you choose (if more than one study path is available). This test is for diagnostic purposes only; in other words, your answers and your scores are used to help you better understand your strengths and weaknesses in math or English. Once you have completed the initial diagnostic, EdReady will help you to figure out whether you are sufficiently prepared in math or English to achieve the goal. Depending on the version of EdReady you are using, your goals may consist of different colleges or universities that you would like to attend, or different programs of study in a system of higher education, or benchmarks for passing out of specific classes, passing placement tests, graduating from high school, or meeting minimum qualifications for further study. 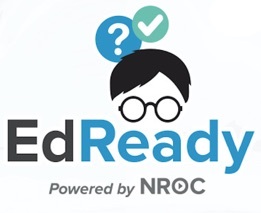 In all cases, EdReady can show you which goals you are ready for, and which you are not. In the cases where you are not ready, EdReady will help you to achieve your goals by referring you to multiple educational resources that are matched to your specific needs and preferences.